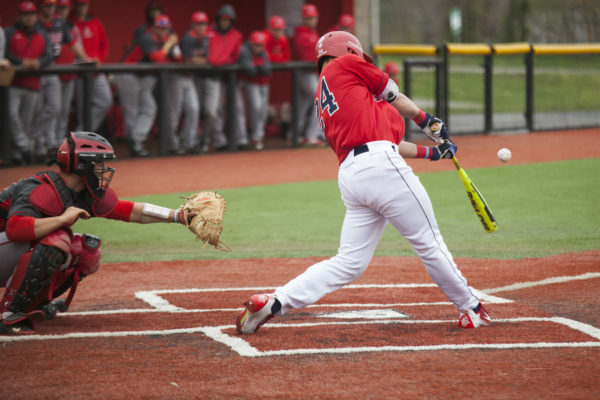 Following a successful opening series victory against Nicholls State, the Stony Brook baseball team went down to Virginia for a set of three games against Iona, Sacred Heart and host Norfolk State. Stony Brook’s offense led the way through a three-game sweep of the set, improving its record to 6-1, its best start since the program moved up to Division I back in 2002. The first ever meeting between Stony Brook and Norfolk State wound up being a one-sided affair, as the Stony Brook offense scored at will while dominating from the mound. Junior catcher Sean Buckhout got the scoring parade started in the third inning, as he singled home sophomore infielder Nick Grande from second base. Freshman infielder Michael Palazzolo would double him home, then score off a dropped throw to the plate after junior outfielder Cristian Montes hit a grounder to third. The Seawolves doubled the lead in the fifth inning when Palazzolo reached on an error to score Buckhout, and was driven home on a double by sophomore outfielder Michael Wilson. Senior infielder Bobby Honeyman hit the sacrifice fly to score Wilson and wrap up the inning. While the Seawolves offense got going early, sophomore starting right-handed pitcher Brian Herrmann made sure the Spartan offense stayed grounded. Herrmann delivered the best start of any Seawolves starter in the early going of the season, as he went five innings without allowing a run, striking out four and walking one on an efficient 62 pitches. Head coach Matt Senk opted to save Herrmann’s arm as the lead took off, relieving him with senior left-hander Kevin Kernan and freshman right-handed pitcher Nick Insognia. Stony Brook knocked out Norfolk State’s junior starter Trey Hanchey in the seventh after a leadoff single, jumping right onto sophomore left-hander Jalen Rudolph. Junior right-handed pitcher Michael Russell, Buckhout and Wilson would all pick up RBI in the inning, and the lead ballooned to 11 runs. Junior outfielder Dylan Resk tacked on one more in the eighth with a sacrifice fly to complete the blowout victory. Stony Brook faced Sacred Heart in their second game. The Pioneers are another historic underdog when facing the Seawolves, as they were behind 19-7 in the all-time series. This time, it appeared as if Stony Brook would run away with their 20th victory over Sacred Heart, but a late rally almost ruined the day. The Seawolves offense got rolling early in the game, as they scored in each of the first four innings. Honeyman was at the forefront of the offensive explosion, as he tripled home a run in the first inning, singled in another in the third, and hit into a fielder’s choice in the fourth to plate a third. Sacred Heart’s defense only added to the damage that Stony Brook created. Sacred Heart committed five errors on the afternoon, four of which came in the fourth inning. Stony Brook took full advantage, scoring four times in that frame and pushing its lead to seven runs. The Pioneers never went away, however. After being held hitless for three innings by junior starter Bret Clarke, they collected four consecutive singles to score their first two runs in the fourth. Clarke would allow a runner to reach scoring position in each of the next two innings before being relieved by freshman right-hander Brian Morrisey, who escaped a bases loaded, no out scenario to hold onto the five-run lead. Morrisey held the lead into the ninth inning before surrendering a leadoff home run to senior outfielder Dan Schock, which kickstarted the rally. Morrisey allowed two more baserunners before being relieved by senior left-handed pitcher Cole Creighton, who got the first two outs of the inning before giving up a pinch-hit single that scored both runners. Creighton gave up another run to give Sacred Heart six unanswered runs before Pinto came in to record the final out. The first game of the weekend pitted Stony Brook against a familiar foe in Iona. Stony Brook has dominated Iona when they’ve faced off, leading the all-time series 13-3, and they added to the win column again this weekend. Buckhout delivered the go-ahead runs in the sixth inning, when he lined a single to left that brought home junior infielder Brandon Alamo and Montes to make it a 5-3 game. Buckhout also laid down a sacrifice bunt in his first at-bat in the second inning that put Montes in position to score their second run of the game. Redshirt-sophomore right-hander Greg Marino started for the Seawolves against the Gaels, and had a strong performance marred by two innings. Things got off to a tough start for Marino as he allowed a leadoff double to junior infielder Fran Kinsey, who later scored off a grounder to shortstop. Marino cruised through the next two innings before trouble brewed in the fourth. Pitching with a two-run lead at this point, Marino allowed the first two batters to reach, then threw a wild pitch to allow the lead runner to advance to third. After a single drove home another run to cut the lead to one, Marino got a double play ball to erase a runner and get him close to escaping with the lead. Marino exited the game after throwing five innings, surrendering the three runs on five hits but striking out five while only walking one. Redshirt-sophomore right-hander Aaron Glickstein came on in the sixth to relieve Marino, and earned the victory by pitching two and two-thirds shutout innings. Glickstein allowed only one hit and struck out three before passing the baton to senior closer Aaron Pinto, who struck out two in the final inning and a third to earn his third save of the season. A huge test awaits the Seawolves next weekend, as they travel to Gainesville to take on the top-ranked Florida Gators from March 2-4. The Gators are currently 6-1 this season, dropping their first game of the year on Sunday to Miami, and will play a two-game set against North Florida before their series with the Seawolves.